The information contained in the magazine is intended to provide broad understanding and knowledge of health and nutrition topics. This information should not be considered complete and should not be used in place of a visit, call, consultation, or advice from your physician or other healthcare provider. We recommend you consult your physician or healthcare professional before beginning or altering your personal exercise, diet, or supplementation program. Opinions expressed in this magazine are those of the author and do not necessarily reflect those of ownership or management. 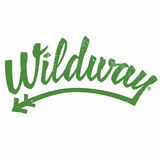 No liability is assumed by Wildway, LLC regarding any content in this publication. Introducing... Wildway Fruit & Nut Snack Mixes On-the-go fuel with flavors that will transport you across the world then make you want to pack a bag and travel there yourself. At Wildway, we’ve always believed that food should do more than just satiate hunger. We believe it should fuel life’s daily adventures and inspire new adventures. That’s why we’ve created these Snack Mixes- to take with you as you LIVE WILD every day. Coming in three flavors- Salted Chocolate Truffle, Toasted Coconut Latte, and Pineapple Mojito- these snack mixes are wildly different, wildly delicious, and unlike anything else out there. Made from only nuts, dried fruits, and spices, they are grain-free, gluten-free, nonGMO-sourced, paleo-friendly, sweetener-free, and made with 100% real food ingredients. Wildway Fruit & Nut Snack Mixes were created for your individuality. We chose unique flavors because YOU are unique. 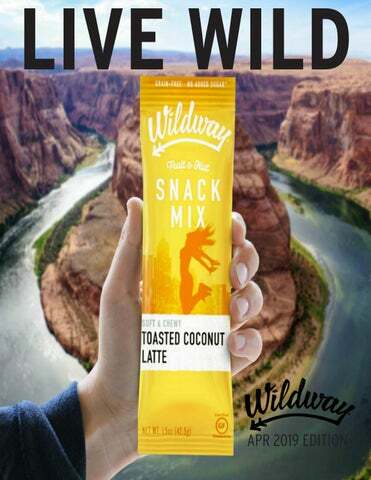 You have your own Wildway of Life and these snack mixes are the perfect grab-and-go food as you pursue that lifestyle- whatever it may be. Check out the next few pages to see how you can enjoy this new product. Hop on a plane to an exotic island! Everyone has had the infamous Swiss chocolate, but there’s nothing like going to the source. Travel to Broc to see some of the worl’d oldest chocolate factories. Known for its quality, Belgian chocolate can be found on every corner in this beautiful and historic city. Mexico is birthplace of chocolate and this capital city is full of delicious chocolatiers to visit and get your fix. Take a bite of the Big Apple and some of the finest chocolate in the city known for all things gourmet. Called Italy’s “Chocolate Capital,” this city even has it’s own Chocolate Festival every year in February. Located in a hidden national park, this beach is secluded and beautiful. It’s famous for the wild monkeys that roam freely and provide lots of entertainment. Known to be Canada’s warmest saltwater beach, this is a must for anyone looking to get away and relax on some golden sand dunes. Located on the island of Madagascar, this beach is literally off the beaten path. However, its clear waters are the prime spot for snorkeling and scuba diving. Great for surfing and exploring caves, this picturesque beach is the ultimate ocean getaway. An ocean escape with the chance of seeing wildlife like kangaroos and wallabies. Need we say more? Tucson, Arizona Head to the desert oasis for whitewater rafting, and exploring the nearby state and national parks. Austin, Texas Hike the Greenbelt, paddleboard on Lady Bird Lake, ride a bike on the Town Lake Trail, and catch a concert in the Live Music Capital of the world. Boulder, Colorado Hit this Rocky Mountain town for lots of hiking, mountain biking, and climbing. Seattle, Washington Home to the REI flagship store and surrounded by lakes and nature parks, this city is full of things to do. Virginia Beach, Virginia Head to the beach to do some kite-surfing, skating on the boardwalk, and sand volleyball. but it still makes for a long bonding experience for 4 friends in a vehicle. After spilling coffee on my new seats, nearly running out of gas in a town called Iraan, and dodging a couple of tumbleweeds (yes, tumbleweeds exist in west Texas not just in movies), we made the turn onto Highway 385 to Big Bend National Park. As you get closer and closer to the park entrance, you begin to feel you’re on a different planet. And when we finally reached the “Big Bend National Park” sign, we knew we were in a place unlike any other. As we drove the open road into the park, we could look out any window and not see anything but an empty- yet stunning-landscape. Not a building, car, or person in sight. Just a vast desert dotted with the occasional coyote or road-runner and a clear sky painted with the silhouettes of the Chisos Mountains. Don’t run out of gas. Fill stations are few-andfar-between both inside the park and outside. Be aware of what you have in the tank. Reserve campsites or get there early. We pulled over at the first trailhead we saw, applied some sunscreen, grabbed our CamelBaks, and set out on a hike called Devil’s Canyon. As we trekked over the cracked land with the sun beating down on us, we were reminded of why exactly we chose to drive 8 hours in a crammed truck out to this desert. There’s something about setting out across an uninhabited space for the single, simple purpose of walking to a place you’ve never been and witnessing things you’ve never seen. It was on that first trail that we realized how glad we were we chose to spend the weekend conquering one of the largest national parks with nothing but our tents and some dehydrated meals. That realization was only increasingly verified at each turn, every trail, and any look around us. The roads traveled, miles traversed, rocks climbed, sunsets and sunrises seen, bruises and blisters endured, memories made, and bonds of friendship affirmed on this 3-day adventure in Big Bend are priceless. Far more valuable than any birthday gift. 3 campsites, 10 hikes, one jar of peanut butter, a few beers, lots of Wildway granola, and one close call of running out of gas later- we left that beautiful wasteland and started the long trip back to Austin knowing we would definitely be coming back. Big Bend National Park. We went, we saw, we did, we had a blast. We tried it- you should too. This trail begins with a 6-mile ride on an unmaintained dirt road, for which you better hope you’re in a vehicle with good suspension. Once you reach the trailhead, you embark on an easy 2-mile hike amidst scattered red rocks that resemble something like the environment of Mars that leads to an unbelievable, unexplainable balanced rock that you must see. One of the most popular hikes in the park, this trail leads through narrows, cliffs, polished rocks, and small water streams and ends at a keyhole lookout that you’ll never want to leave. It’s a moderate 4-mile round-trip trek and many have spotted deer, mountain lions, and even bears on this trail. 5 miles round trip, tons of elevation change, and diverse terrain. This moderate-to-challenging trail in the Chisos Mountains has countless stops for unbelievable vistas and lookouts over both Mexico and Texas landmarks. The peak of Lost Mine Trail is hands-down the perfect spot for a picnic lunch. A short but perfectly picturesque trail inside the canyon of the Rio Grande River, this hike is probably one of the most iconic Big Bend attractions. Nothing like hiking into a 1,500 ft deep canyon to put life into perspective. Added plus: depending on the time of year, the river is shallow enough to wade out into and stand right in the middle of those international waters. Short trail along the Rio Grande River that leads to one of the best hot springs imaginable. These springs only open when the sun goes down and don’t close until the sun comes up, making for an incredible moonlit (or headlamp lit) hike to a perfectly hot pool sitting only a literal stone’s throw from Mexico. If you’re wild, you’ll swim across and touch some foreign soil. Bring lots of water and sunscreen. Even the parts of the park that aren’t desert get a ton of intense sunlight. Put your tent up in the basin of 8,000 ft peaks for the best sleep under the infamous “stars at night” that are even bigger and brighter in Big Bend. An ideal site right by the Rio Grande River, this campground is all green grass and cottonwood trees. A little oasis in the middle of the desert. Bonus: you’ll most likely be greeted by javelinas and other wildlife when you’re sitting outside your tent. Terlingua is the nearby ghost town right outside of the park. All lodging in this hardly-a-town is unorthodox, but the best stay is a tipi. These Native American style tents are set on a secluded ridge with the best desert views I have ever seen. Build a fire and tell some scary stories before you go sleep like the Chisos Indians, then wake up to the sunset coming through the tipi flap. There are NO FIRES ALLOWED in Big Bend so don’t bring food you need to cook over an open flame. Many of us who have spent any amount of time living with all our worldly possessions neatly (or not) tucked away in a pack on our backs, know these series of questions. It’s the proverbial courtship of travelers from all over the world and how we develop the foundation of what could be a fleeting or ironclad friendship. We all have experienced that heart-throbbing sensation of wanderlust that threatens to disrupt our daily routines and thrust us into a life of consistent motion. Although I’m not here to advocate you quit your day job tomorrow (or maybe I am) there is a strong argument to be made to travel to locations that force you out of your comfort zone and into personal development. Many of us struggle to find the time in our daily lives to simply reflect on where we have been and where we would like to go. Travel, in general, is a fantastic medium to inspire and influence our next big move in life. Going to a new place, often where you don’t know anyone or speak the local language, on its surface is scary. However, more often than not, the tension washes away once you arrive. Instead, an overwhelming sensation of excitement, and ultimately accomplishment when you arrive back home safe and sound, are the feelings that take over. It’s so easy to get wrapped up in our own worlds. Our problems often feel insurmountable. Simply taking time to appreciate all we have can really put our lives and issues into perspective. It’s widely accepted that memories, especially fond ones, garner more value over time. With this in mind, travelling makes for a much wiser investment than “stuff” to which we apply fleeting value and quickly fall out of love. The more you travel, the longer the list of desired destinations becomes. You might as well start making progress now before you get behind. This is your year. Hit the road, fly the skies, or hop on a boat. Go somewhere new, see something different. types of moments make my worries, my fears, and my insecurities feel small. They give me perspective, and they leave me humbled and grateful to be in existence. shifted my perspective to favor seeing new places over getting new things. As you summit a mountain after a difficult hike nothing seems more important than putting yourself in the way of beauty and chasing that feeling again. I took my first trip in the summer right before leaving for bootcamp, it was the first time I got to plan a trip, pay for everything, do what I wanted, when I wanted. It was my first real taste of absolute independence and freedom. I was 18 and I bought a grey hound bus ticket from Seattle to Los Angeles, booked a week in a hostel, and printed out a million google maps (this was before everyone had smart phones!) and all this, before telling my parents of my intensions. Needless to say, they were quite shocked when my tickets came in the mail! That trip impacted me more than I could have ever imagined it would. That’s when I was bit by the travel bug. There’s something so fulfilling about seeing a picture of a place or a video and dream of going there—and then you finally do, and it leaves you speechless. After that trip I spent the next four years active duty in the military, traveling only when I was granted permission, to places that were considered “ok”, and after doing piles of paperwork. Joining the military at 18 was by far the greatest and smartest decision I could have made for myself—but leaving the military was also the greatest decision. Since my new-found civilian freedom, I’ve gone on a travel binge. In the last year I’ve been to the US Virgin Islands, British Virgin Islands, Iceland, Mexico, Costa Rica, Peru, and Switzerland. I have no intensions of slowing down. I love traveling because it’s such an adventure. Meeting new people, seeing new places, doing crazy things, hearing new languages, it’s all part of the experience. I even just went paragliding for the first time. Once a year travel somewhere new. from Houston to Austin, covering a 150-170 mile stretch through the Texas Hill Country. This ride is one of the largest bike fundraisers, raising more money than any other cycling event and involving people from all walks of life united in passion and with one mission-- to end Multiple Sclerosis. The National Multiple Sclerosis Society, who receives the money raised from the BP MS 150, uses 85¢ of every dollar raised on research programs and services, not just in the U.S., but the across the globe. At this point you may be wondering, what is Multiple Sclerosis exactly? Multiple Sclerosis, also known as MS, is an auto-immune disease that affects the central nervous system. The immune system of someone with MS attacks the Myelin surrounding nerve fibers and even nerves themselves, this damage may cause an extensive number of symptoms. These symptoms range from numbness or slowed cognitive processing, to the more severe like blindness or paralysis, with many others in between. There’s currently no cure for MS and no known cause for it either. That’s why the BP MS 150 is so important and that’s why Wildway rides. CURE Getting involved by donating, riding, or volunteering will have an impact on the 2.3 million people worldwide living with MS. Last year, this race raised 14 million dollars. This year looks to beat that. In 2018, Team Wildway embarked on the MS150 mission for the first time and we plan to do it for many years to come. As a company dedicated to making a difference in the world, we were excited to participate in such a challenging activity that benefits such an important cause. Nothing says “living wild” like riding a bike 150 miles in two-days! As we get ready to ride again this year on April 27th, 2019, Team Wildway is excited for sore muscles and happy hearts as we get back on those bikes and make the trip from Houston to Austin with our new Fruit & Nut Snack Mixes to keep us fueled along the way! The BP MS-150 is an opportunity to challenge yourself, inspire others, help a great cause, and live your life to the fullest. It’s the perfect chance to Live Wild. Reese is a member of our Wildway Crew and her Wildway of Life is cycling. So, who better to ask for tips on how to train for the BPMS150? Here’s her advice for the race-newbie to go from couch potato to 150 mile champ. You’ll want to have a bit of an endurance base for this event, which means you’ll need to spend a bit of time in the saddle logging base miles if you don’t already have a bank of endurance to draw from. These miles are not slow leisure rides consisting of coasting along. Rather they are a steady paced ride that you can sustain for one or two hours without a problem. You should be able to carry on a conversation during base mile rides. You’ll want to avoid increasing your distance or time of the bike too quickly. To play it safe, don’t jump up by more than 10% each week. Adding some intensity to your rides can boost your power and make you a stronger rider. Not every workout needs to be intense, but adding harder workouts a couple of times a week can be beneficial. Here are a couple to try out: •	4x20 seconds hard, with 80 seconds of moderate intensity. Recover for 5-10 minutes. Repeat 3 times •	2x20minute all-out efforts. The most important thing you can do to ensure a successful ride is to set up your bike comfortably and to ride as much as you can. The more you ride, the more you’ll ride. And the easier it will become. 1. Ride a bike Cycling is one of the best ways to burn some serious calories. Plus- itâ&#x20AC;&#x2122;s fun, gets you outside, and takes you places far better than the inside of your gym. 2. Go hiking Ditch the treadmill and walk on a trail instead. Trust us, the view and the workout is far superior. Take a hike. 3. Find a park Want to feel like a kid again and get some exercise too? Go find a playground or local park and do some push-ups, lunges, pull ups, and even swing on the monkey bars. 4. Paddleboarding It might not yet be hot enough for a swim, but you can still get out on the water and burn some calories on a stand-up paddleboard. 5. Road races Springtime is peak season for marathons, halfs, 5ks, 10ks, etc. Find a local race and enter. WILDWAY CHALLENGE 5 Steps to Live Wild: 1. Find 5 material items you aren’t using and donate them to someone in need. 2. Play a sport you’ve never tried before. 3. Eat a meal that includes every color of the rainbow. 4. Reduce your screen time by at least 10% for a week. 5. Take a Wildway Snack Mix on your next adventure. Want to write for Live Wild Magazine? Drop a line.